TPC Overall Rank: #289 out of 2933 rides. User Tracker Count: 383 times. Although it was an ok attraction, it was not what I expected. In the grand scheme I was disappointed. The construction was amazing, I do say that! The water tunnel was really cool. i much preferred the original show. Good show. The theming is top notch and the building looks great. I also really liked the cool water tunnel, but the acting wasnt the greastest. However, I liked the plot and the final battle scene was well done. The junior archeologist actor did a real good job and kept the audience entertained throughout the journey. I was mesmerized walking through the water tunnel, but then again I get distracted by shiny objects. 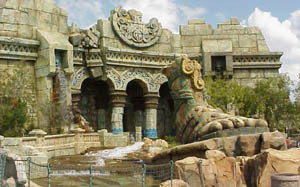 The theming of the attraction is well done and this attraction also breaks the struugle of being in the sun all day. Maybe it was waiting behind a guy whose BO was so pungent that even while standing 15 feet back I still had my shirt over my nose. Maybe I was grouchy from being tired and sore. Maybe I really wanted to sit down. Whatever it was I did not enjoy this attraction. The live actor annoyed me more than anything else. The story of being trapped inside didnt grab me. Apart from the awesome water tunnel I think this attraction is a waste of an awesome looking building. 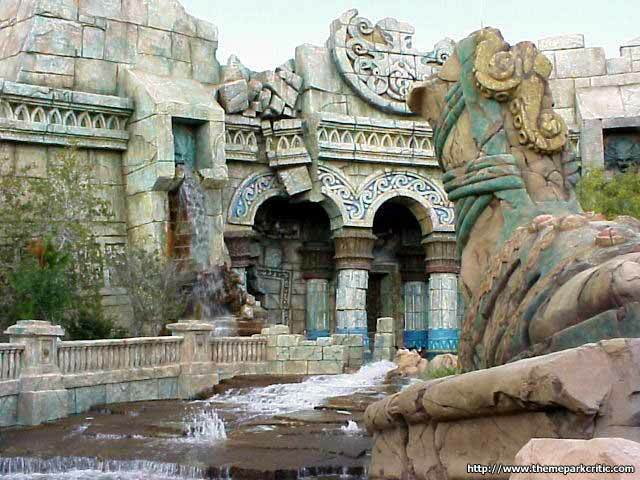 Maybe theyll put this to good use when they re-theme the Lost Continent to Harry Potter. At first a classic, then it changed for the first time, a negative change in my opinion... However now they have taken away one of the main elements to this attraction in removing the water vortex which is essential to the overall enjoyment of the attraction for me. Very dissapointing the last time I visited which was in January of this year. I hope they decide to put back this great feature. I have to admit I am very impressed with this attraction. The entire building is extreamly cool. The entire show takes place in various different chamber and guests transport from one to another wich is a new approach of presenting a show. The storyline is simply but is not really addas up the experience. Luckily the story isnt too imporatant. The dazzling effects will take place. Water vortex effect is simply beyond discription and definitly one of the coolest one that Ive seen. The finale battle is filled with water fire and laser effect with excellent sound system. The show gave me a feeling of Vegas show but with top notch technology combined. One tip for this show is to stay in the back of the first chamber cause when the door in the back open you will be the first to walk in. The water vortex and the finale battle have to be fulled enjoyed by being in the front. Also, beware to stand for quite a long time so make sure you have enough rest in the resataurant before this show. So much amazing theming for such an average to below average acting job with an extremely cheesy story line. I really wish they turn this into a new ride of some sort. The outside looks so cool as well as the inside. You go from room to room going listening to this energetic guy talking about who knows, and before you know it your through a couple of rooms or temples and its done. The finale is 2 guys on a 2 seperate tv screens fighting eachother with water fountain and fire. This rides line was death. We probably waited for about 2 - 3 hours. It is a very long, dark tunnel. Then once you think your at the end of the queue theres another queue! Then once your done with this you go into a large room where evreyone gathers. 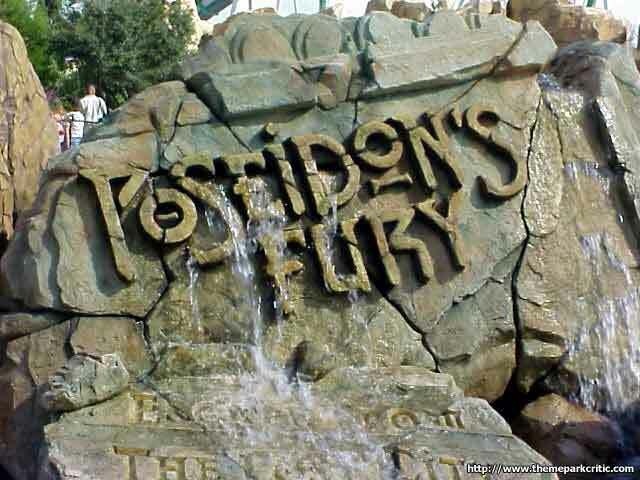 Then the tour guide tells you a story about Poseidon, etc, and you travel through a few more rooms in the house, walk through a walkway with water spinning all around you(its very cool), and then the finale is Poseidon battling (i dont remember), and Poseidon wins, and its a very good ending. One of my favorite attractions at the park. Our "tour guide" for the walk through show was very goofy and added to the fun. To me, the finale is pretty much makes the attraction. You walk through the "special hallway" which is totally mesmorizing. The final room goes dark, and when the lights return you are in an enormous auditorium where you are dazzled with water effects, huge flame bursts, and plenty of other pyrotechnics. If you arent amazed, I dont know what would amaze you.